This weekend was HOT HOT HOT! To me there is nothing better than a blue sky, and I really notice the difference a sunny day makes to my mood. This weekend I was fortunate enough to escape the city to the English countryside for some much needed ‘R&R’. Realising that it was going to be the hottest weekend so far, I suddenly felt a bit panicky. I hadn’t even looked at my summer clothes or swimsuits for a year, and was not overly enthusiastic at the thought of getting my ‘milk bottle’ pins out. My eating disorder has made me hyper-critical of myself, and while winter is my least favourite season, it is easy enough to hide my body under layers of jumpers. If I am feeling too thin or too fat, I can cover myself with another garment, but when it’s hot – you look bloody ridiculous wearing tights and jumpers when everyone else is in T Shirts and Flip Flops! I wonder if without my anorexia I would be as self-conscious, but it seems to me that there are very few people out there – men or women who are not at battle with their appearance. 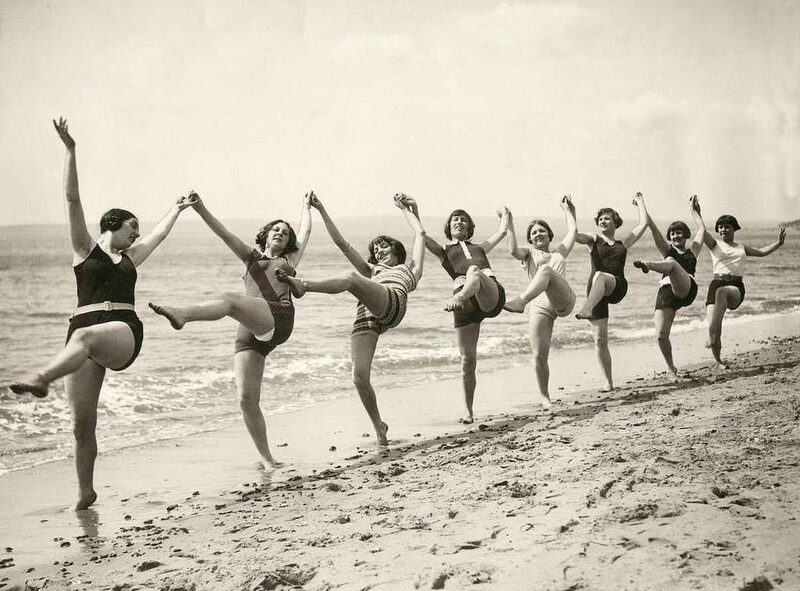 This photo was taken nearly 100 years ago, and to me the women look healthy in their bodies and minds, connected with each other and focused on having fun. Many of the images that I scroll through on social media these days seem a million miles away from this. Images now are less about what is being captured in the picture, but more about capturing yourself in your most perfect form, which has been edited, filtered and/or airbrushed. It saddens me that we (including myself) are not happy with our bodies as they are. Why do we feel uncomfortable in just showing ourselves just as we are? I wonder if the women in the picture spent hours beforehand worrying about how they would look in their bathing suit? Somewhere along the line, we have become immersed in a culture that is so focused on aesthetics that it has become too easy to forget what we are about on the inside. So with that in mind, I headed out of London determined to leave my insecurities behind. As I sat in the garden in my swimsuit I reminded myself not to be so self-obsessed, and instead I enjoyed the wonderful company surrounded by nature. At times it was hard to keep my mind focused and not wander into thoughts of my body, but it felt so good to ‘let go’ and just be. I enjoyed some lovely food, wonderful company and a little too much fizz. But this is what life is about, this is what recovery is about – not being so self-consumed that I am unable to enjoy and be grateful for simple things. My message really is that, there is no one ‘perfect’ body. We are all unique and our bodies change so much over a lifetime, that no one day is the same. I have learnt that my feelings around my body are not just a reflection of what I look like in the mirror, but also an indication of where I am in my mind. This weekend was a helpful exercise for me in two ways. Firstly it made me confront my body head on. It can be all too easy for me to be in denial about where I am in my physical recovery when I am covered up in jeans and jumpers. Secondly it made me realise that in order to feel more connected with myself, I need to be connected with others and be ‘in the moment’. Being caught up in what I look like, leads to a complete disconnect from the world and only serves to reiterate my insecurities. My hope for me and others, who hate on our bodies, is that one day we will be able to disregard the ideals that are placed on us, and instead focus on the ideals we set for ourselves.